I’ve been a little ginger-obsessed lately, so it was only natural to concoct perfect, raw vegan gingerbread bites. These are so good! They’re flavourful, chewy, delicious and take 5 minutes to make. One of my most popular posts on the blog is my post all about Easy Vegan Snack Ideas, so I guess a lot of people out there are looking for vegan snack ideas. 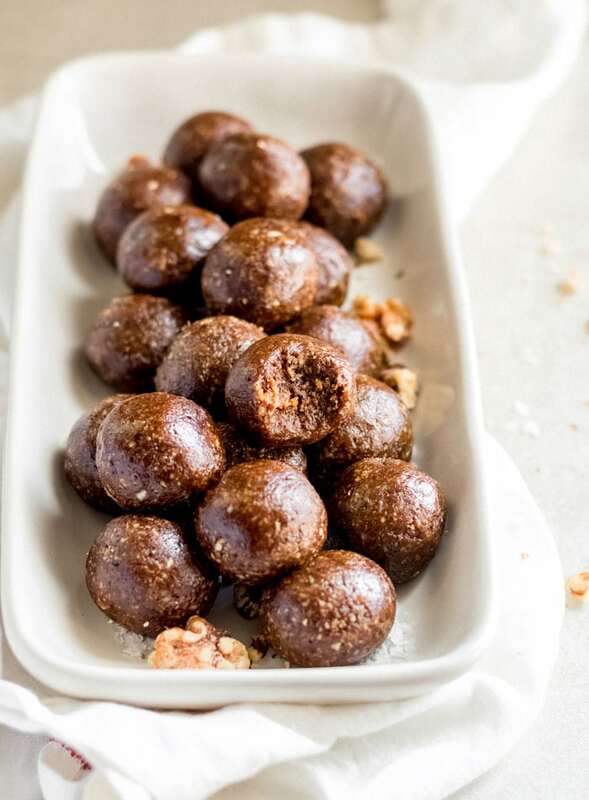 These healthy, raw vegan gingerbread bites can definitely be added to the list. These make a great snack for busy days, just throw a few in a ziplock or Tupperware and you’ll be ready to stroll right past the vending machine. Healthy, vegan snacking is actually really easy if you’re prepared. Think lots of fresh fruit, raw veggies and hummus and of course, homemade energy bars and bites. As usual, these little guys are completely vegan and naturally gluten-free. They’re sweetened naturally with dates, molasses and a little maple syrup. 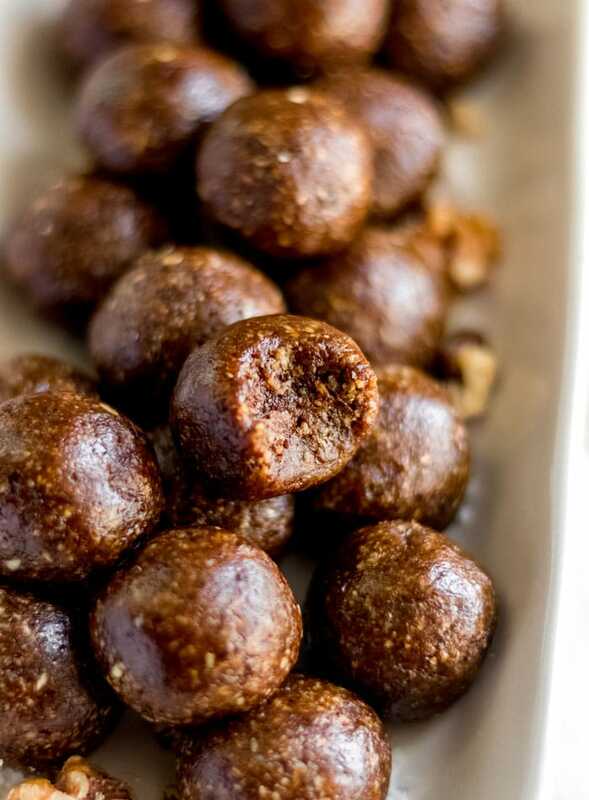 You can feel good about popping one or two and they make a great alternative to those drool-worthy but sugar and butter-loaded, coffee shop ginger cookies. 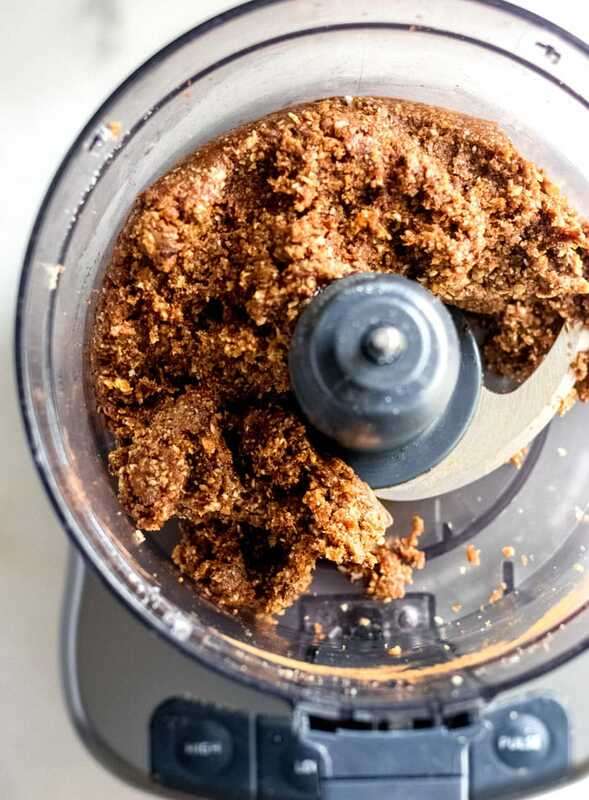 To make them, all you need to do is add everything to a food processor, blend it up and you’ve got yourself some gingerbread bites. These are healthy enough for a snack, delicious enough for a snack and even work great for holiday goodie trays. 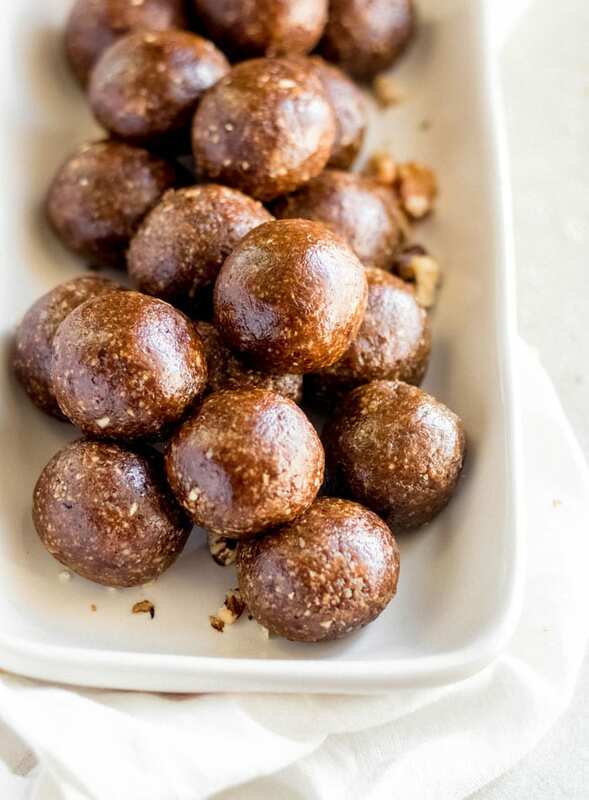 Sweet little no-bake gingerbread bites that take just 5 minutes to make in a food processor. Try them for a healthy holiday treat or snack on-the-go. You can even enjoy them as part of a healthy breakfast. 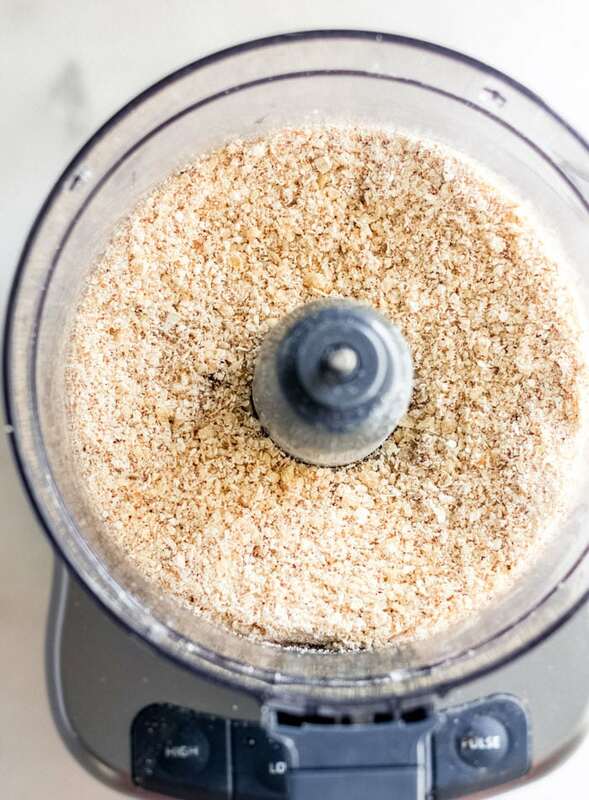 Add the walnut pieces and oats to a food processor. Mix until broken down. Add the dates and continue to process until it forms a dough. 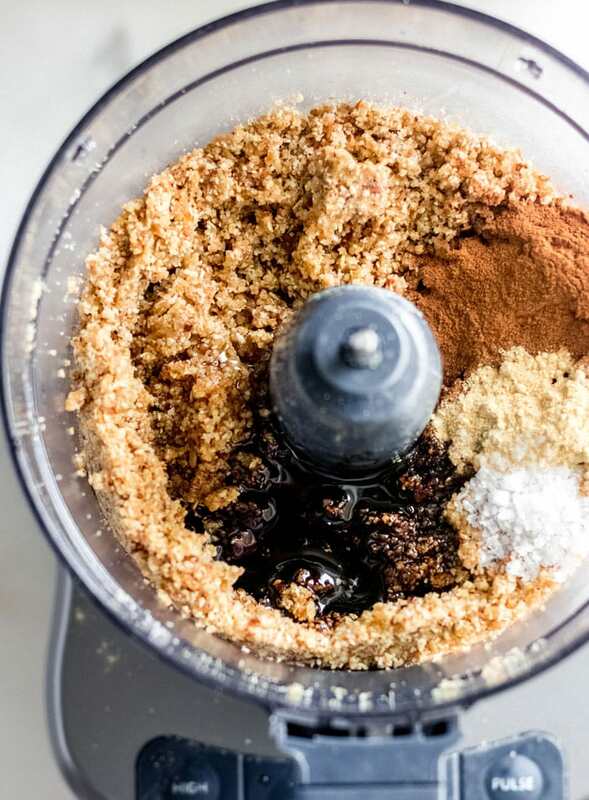 Add in the rest of the ingredients and mix. Remove from processor, roll into balls and enjoy! What a quick and tasty recipe. It’s the perfect snack to have on hand. Totally! I almost have some kind of bites in the fridge for a quick, tasty snack! They’re totally Christmas cookie tray worthy!! Enjoy!! Made these with a pinch of cloves and half raisins and dried cranberries instead of the dates. A combo of your recipe and this one:http://www.rawmazing.com/raw-food-and-travel/. Yum! I love blackstrap molasses. Thanks for sharing this! I lovvve molasses too. I hope you enjoy them! Let me know if you try the recipe! I am not keen on dates. Any ideas on a good substitution? You can try to use raisins but I’d recommend soaking them in hot water for 15 minutes then draining before using. Another dried fruit may work but of course will change the taste of the recipe. I can’t guarantee any of these though since I’ve never made them without dates. 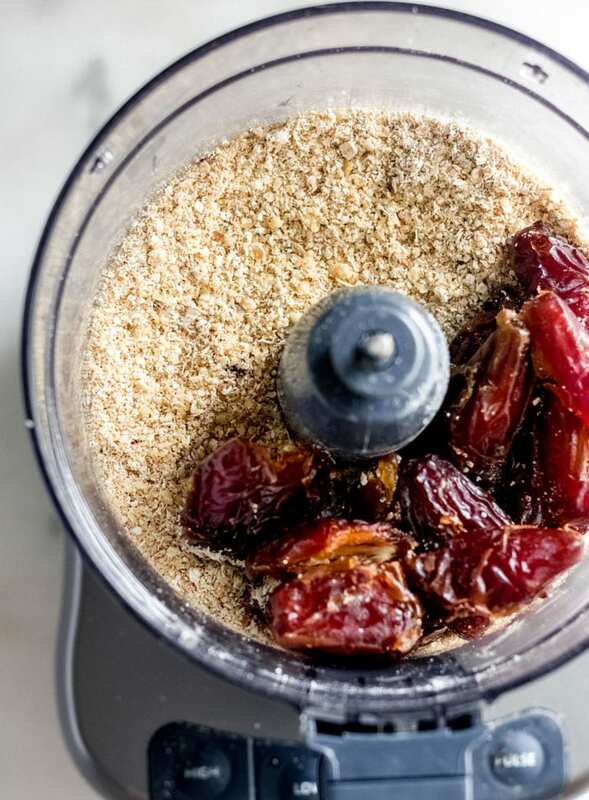 Your best bet would probably be raisins, that being said, they don’t really taste like dates with all the spices and molasses in there so maybe give them a try with dates anyways? Delicious! Made these today for a snack and they are incredibly easy to make. I also love that they had a strong gingerbread flavor. Yay! So glad you liked them!! And yes, gingerbread all the way! I love the molasses ginger combo, so good.